Caroline Ritchie is a performer on all sizes of viol, medieval fiddle, lirone, and early cello. Her interests lie across a broad spectrum of music, from the mid-15th to the 18th centuries and beyond. She is a champion of lesser-known corners of the repertoire, including the virtuoso music for viola bastarda, but is drawn to and engaged by anything which will bypass the ears and reach straight to the human soul. Her favourite composers are (in no particular order) Machaut, Bach, Marais, Lawes, Gibbons, Josquin, Schütz, Monteverdi, Schubert…the list goes on, and is constantly added to. Caroline started playing the cello at 4 years old, and discovered the viol in her early teens. She studied at New College, Oxford, the Royal Academy of Music, and later at the Schola Cantorum Basiliensis, where her studies were generously supported by the Leverhulme Trust. She is grateful to have studied cello with Jenny Ward Clarke, viol with Richard Cambell, Rainer Zipperling, and Paolo Pandolfo, and renaissance viols and vielle with Randall Cook. She was inspired by lessons and masterclasses with Sarah Cunningham and Wieland Kuijken. As a soloist, she collaborates most frequently with harpsichordist Ralph Stelzenmüller (a project described by the south German press as ‘musical fireworks’), with violist Henrik Persson, and lutenist Lynda Sayce. A committed chamber musician, she can be heard with ensembles including Ensemble Danguy (Tobie Miller), Per Sonat (Sabine Lutzenberger), Ensemble Leones (Marc Lewon), La Fonte Musica (Michele Pasotti), Le Miroir de Musique (Baptiste Romain), Ensemble Archimboldo (Thilo Hirsch), Servir Antico (Catalina Vicens) and others. She is a core member of viol consorts Newe Vialles (UK) and Compass (Switzerland), with whom she regularly plays and records. 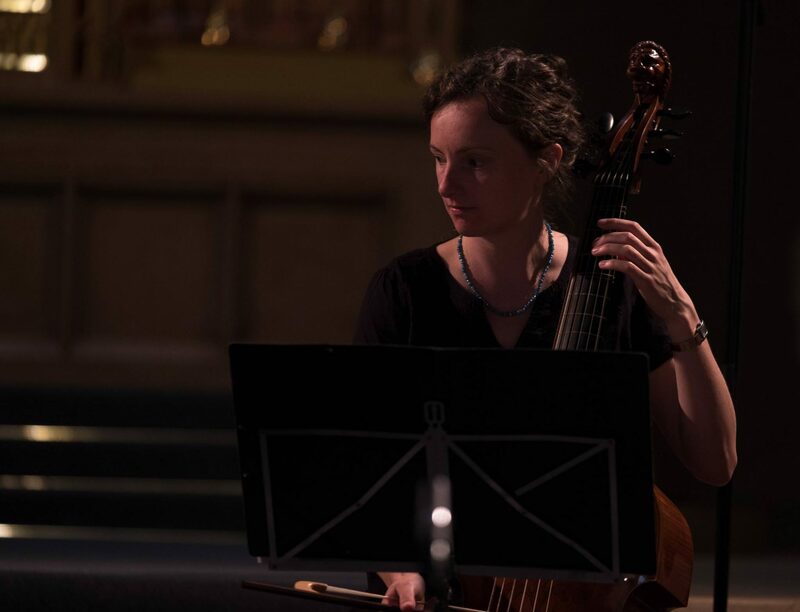 An experienced continuo cellist, Caroline has worked with ensembles including The New London Consort, Barokksolistene, the Dunedin Consort, the Hanover Band, the Academy of Ancient Music, and the Manchester Camerata. She can be heard in all major festivals and concert series throughout Europe, and also plays regularly in Canada. A lifelong love of theatre and the spoken word has led to many collaborations over the years, most recently with the Basel actress Serena Wey. Caroline is a passionate teacher and repertoire coach. Since 2006, she has coached the viol consort at the Royal Academy of Music, and since 2016, has taught second-study viol there too. With Henrik Persson, she co-founded the South West Viols Fest in Culmstock, Devon. She is available for individual lessons, ensemble coaching, consort workshops, and more. Please enquire via the Contact page.